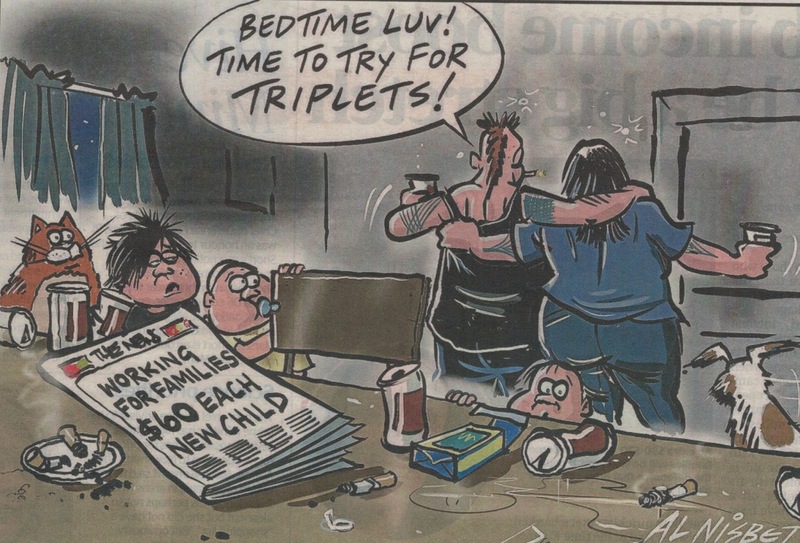 The cartoon below was published in the DomPost, Monday, and has provoked letters of outrage. So I'm adding my two cents worth. So Al Nisbet's cartoon touched a nerve amongst some readers. Why? While somewhat blunt it nevertheless describes a very real problem with welfare - that benefit incomes for families with children are too close to incomes from work. The last Labour government attempted to fix this by introducing the In Work Tax Credit making employment financially advantageous. This Labour government has effectively undone that with substantially increased payments for babies born into workless homes. The less you do for people the more they do for themselves the richer they become. The more you do for people the less they do for themselves the poorer they become. Benjamin Franklin. Lindsay, I didn't find the cartoon funny, but understood the sentiment. As a young child in the 1950's I remember my mother going to the post Office and having her coupon book stamped to receive a few shillings per child which was paid as a universal family benefit. About 1985 I seem to remember, as a parent, receiving the "Family Benefit" of a few dollars per week, per child. This I was able to capitalise to help fund our first home. Since then, the world has gone mad!! When the Family Benefit began (first as the Family Allowance) only children with married parents qualified. For Maori families - larger than European - it was a real boon and some say, drove up their marriage rates. But once available regardless of parental relationship status, the damage began. Misleading cartoon. Why would she have a man in the house when she is paid not to?